Today I had a few items that didn’t quite make up one blog but were blog worthy. A while ago I wrote about Geoff Tucker (linked here). 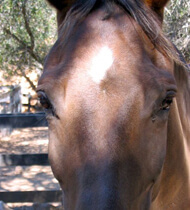 He is an equine dentist back East who doesn’t use sedatives or a speculum. Wow! I found him on You Tube and decided to show you his very informative videos. I just wished I could try him out myself… the videos made a believer out of me. Especially since my horses always seem so groggy and sore after they have dentistry yet the horses in his video seemed happy and relaxed. Anyway, lo and behold, one of you readers contacted Dr. Tucker and had him come out! Below is her report! it had been a little longer than that for mine. response was that they love it when people say that. teeth were rounded off so as not to cause him discomfort. All three horses were cooperative, and there truly was “no drama”. the horses time to decompress, although not much was happening anyway. about nutrition and shared other interesting information. 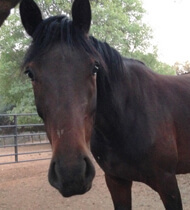 Our July Bucket Fund mare is Spirit. She’s young. Only 8. She ran with a herd of 24 (including a stallion) over a large property. The poor thing is blind which is a difficult fate when running in a herd. 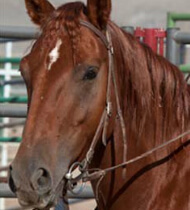 Spirit was badly battered, bloody, injured, skinny and a wreck. 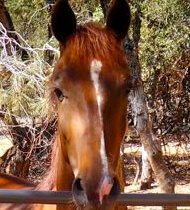 The friends at BHFER picked her up (she’d never been trailered) and brought her to safety and warmth. Here is the story in case you missed it. Good News: The great news is that she is handling herself well and settling in. 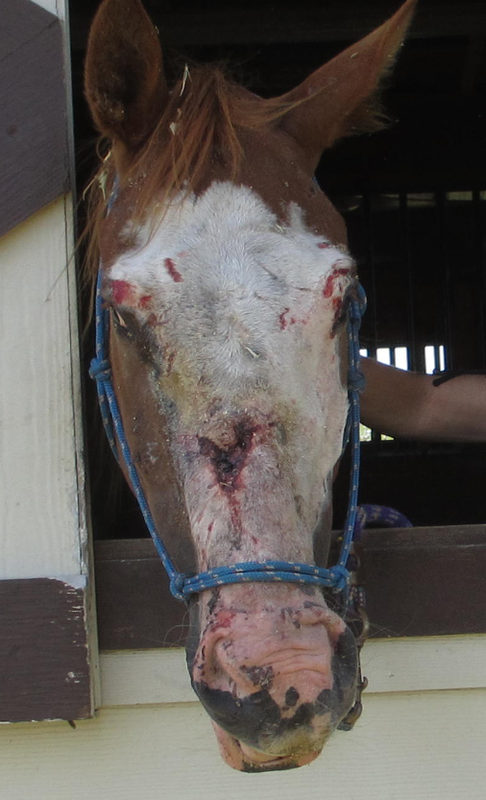 And, once she has gained some weight and can mentally endure another trailer ride, they are going to bring her to a specialist to see if there is hope of restoring some sight in one of her eyes! · She was born with a small eye – she has Microphthalmos of the right eye – a genetic disorder. 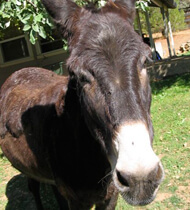 · The left eye sees a small sliver of light – we would like to address this by having Dr. Dennis Brooks examine it and giving us his opinion – maybe there is some sort of surgery that can help her? But first we have to build up her immune system and get her well – she is fighting infection and has a ways to go. · She has a LOT of bite marks – she was clearly beat up repeated over time – some of the scars are old. 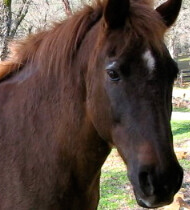 · There was parts of fence wire, old tires, and other items laying around the property (30 acres) that she could of certainly gotten caught up in. It had to have been pretty scary for her – especially when the herd would run – and there were cows. · She was living with a stud and colts. She could be pregnant but her body is in such poor shape we’re thinking perhaps she didn’t have an estrus cycle. I was told she has only had one baby. · One stud herded her badly – he kept herding her away from me for awhile but then I guess he realized I wasn’t going to do any harm – he seemed to genuinely care about her. I made friends with him in order to get close to her. 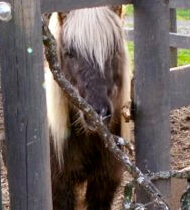 I spent quite a bit of time with Spirit that first day I met her. Once I got within about 15’ of her I sat and observed her. She’d walk, I’d walk. Once she got used to “sensing” me being there, the stud came over to her to move her away, and she stood her ground! 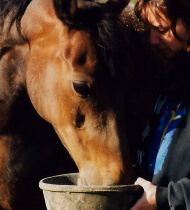 · The owner told me she had been sent off to be bred at some point but then later he told me she had never left the property and had never been on a trailer before. · Her mouth is full of cuts and blisters and she has sharp teeth – she needs an appointment with the dentist as soon as she is up for it. 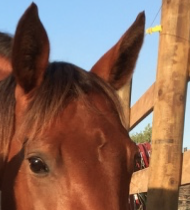 · There is a cut inside of her mouth (up under her lip) that starts on one side and follows the lip all the way to the other side making eating a little painful and difficult. 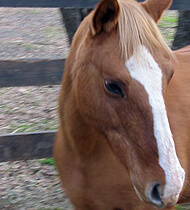 · The vet is concerned about possible sequestered bone at the location of the face injury. 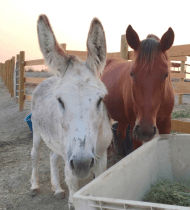 If you’d like to donate to the Bucket Fund and Spirit’s recovery, click here. 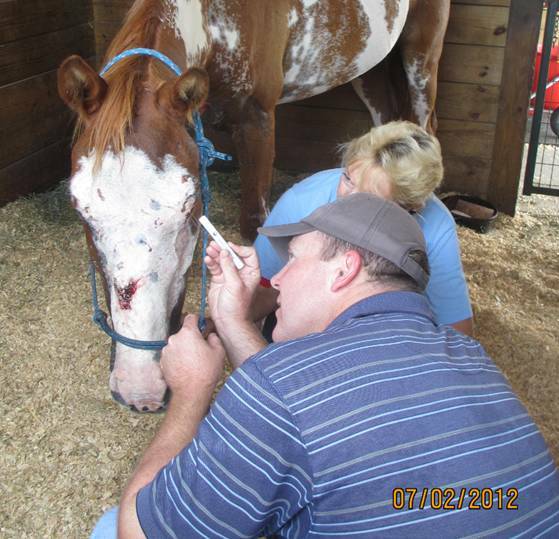 Here is a photo of Dr. Ryan checking Spirit’s eye. She is healing but her wounds are very deep. Especially her nose, chest and back foot. 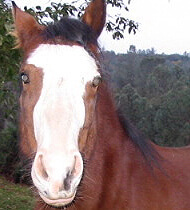 3) EQUION FROM A READER! 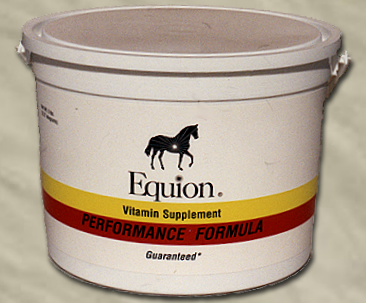 I always talk about Equion as one of those supplements I cannot live without. I’ve used it for 20 years and it is a great all around product with no frills – just good results. –This is the product that my trainers always ask me, “What do you use to make your horses look so healthy and their feet/coats so strong and shiny?!”. 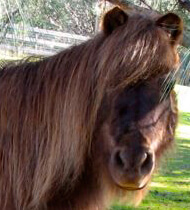 It is Equion. OK, so one of you readers purchased some and this is the letter I received today! Thank you so much for writing about your success with Equion. 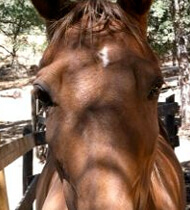 Since your pony found relief from dandruff, I thought I’d try it for my gelding. Heck, I’d tried everything else…why not. 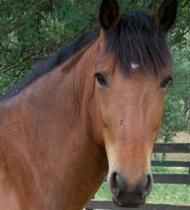 I’ve owned my eight year old gelding since birth. His mother had dry, itchy skin – and he (unfortunately) inherited the same problem. Dealing with his dandruff and constant itch was frustrating for him, and after trying everything I could think of, I was at a loss as to what to do next. Enter Equion…WOW! I’ve been feeding him the supplement for about 90 days now. His dandruff is gone, he actually stays cleaner – dirt doesn’t cling to him like it used to (added bonus – WooHoo!). Anyway… in the past I’d tie him to the hitching rail to brush him, and all he wanted to do was crowd the rail and scratch his chest. He was an itchy mess from nose to tail – but now he stands quietly when being groomed.. He is about the happiest horse on the planet at this point. He is more focused during our rides and his whole attitude about EVERYTHING seems different now. Here is the no-frills bucket of wonderful! I swear by this stuff as an overall digestive, reproductive and coat/foot supplement. It is all natural and it just works. 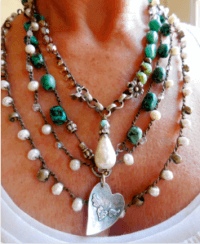 (no affiliation) Free Shipping through July 14! Click image to go to website! 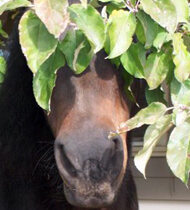 EQUION IS OFFERING FREE SHIPPING THROUGH JULY 14TH so if you are thinking of ordering, now is a good time! Here is a link. So happy to hear that Spirit is coming along!! Also, could you recommend a weight builder supplement?